It never fails. For every bit of good luck in the garden, there's little bad to go with it. 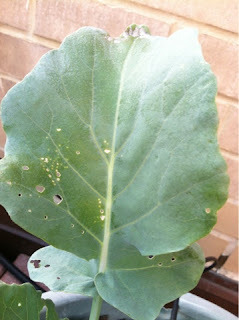 I wrote earlier about how well my broccoli plants--new crops added this season--were doing. Just days after harvesting the first little floret, I woke up to this scene: mysterious pin holes on the Piracicaba leaves. Silver Heights Farm, which sells the organically grown plants at Union Square Green Market suggested that flea beetles were eating my brassica. These tiny pests jump around, so they are hard to find and hard to eradicate. 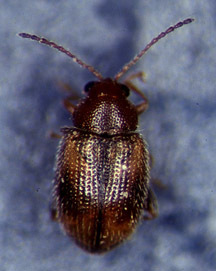 I read that the beetles overwinter in the soil and then lay eggs in the spring. 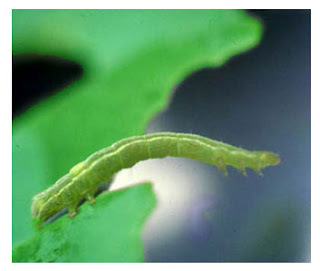 The minute larva eat the roots, though that doesn't usually cause significant damage. When the larva become beetles, however, they start feasting on the leaves creating little "shot holes." This may or may not kill the host, depending on the extent of the infestation and the strength of the plant. But lo and behold, the bugs eating my broccoli were not beetles at all. 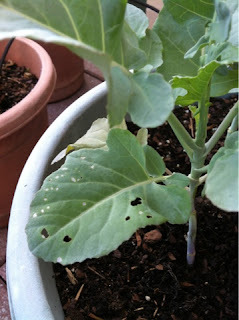 They were cabbage worms - tiny green caterpillars that blend in perfectly with the plant. I found them one morning last week at the crack of dawn. Dozens of them clinging to the leaves and consuming them. I pulled them off one by one and then sprayed with the same Safer Caterpillar Killer that we use to get rid of tomato horn worms. Cabbage worms are larva of white moths, which lay eggs on the leaves. Since spraying, I haven't seen evidence of the pests, so I'm hopeful that the Piracicaba will recover. Now, I hate to point fingers, but I find that every time I buy seedlings from Silver Heights Farms, they come with nasty bugs. I vow every time to avoid the booth, but it does have some of the most interesting veggie varieties, so I have trouble passing it up. Just two weekends ago we bought a Tunisian Backlouti pepper from Silver Heights. We have not seen any bugs yet, but who knows what's lurking.